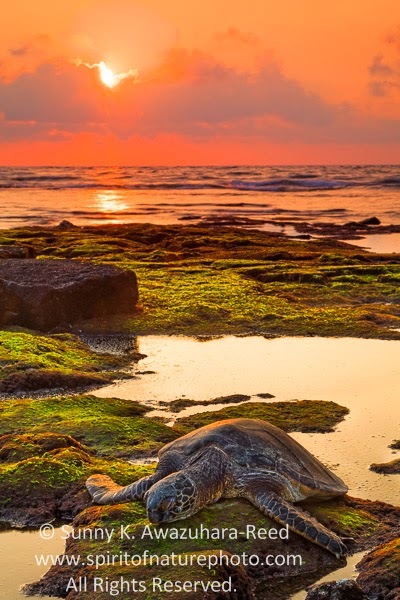 Since my last visit to the Big Island of Hawaii, I'd been dreaming of capturing a certain image - a turtle under warm sunset light. 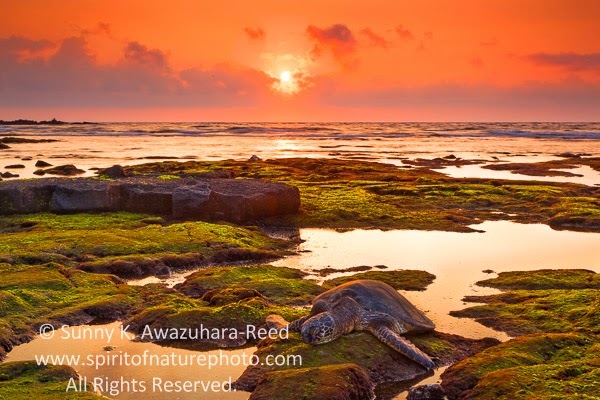 For several months I researched to find the ideal location, the place likely to see turtles, and to be on the west side of the island where the sun sets into the ocean. In December, I flew to Kona, Hawaii again. It was very nice to be in 70 degree weather with plenty of sunshine as opposed to sub zero and dark (only 5 hours daylight) Alaska! A few hours before sunset, I arrived at the beach in north Kona. The tide was low on the coast with the old lava rock beds exposed among scattered tide pools. Fresh green algae growing on the rocks added more color. I spotted the first turtle resting on the rocks and soon after found several more spread around the rock bed area. I visited each turtle and carefully observed the surrounding environment. 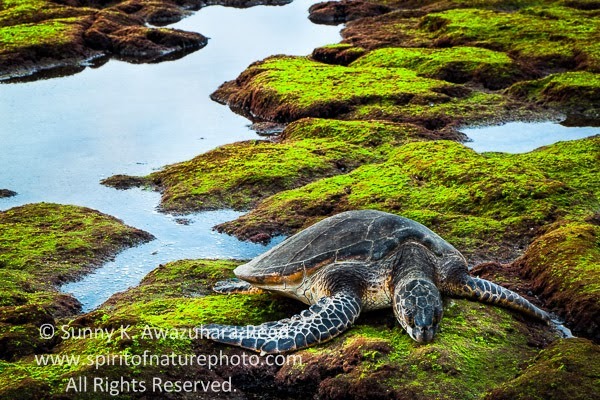 As the sun lowered its angle, I selected a turtle napping near the edge of a shallow tide pool. I carefully composed and set up the camera. 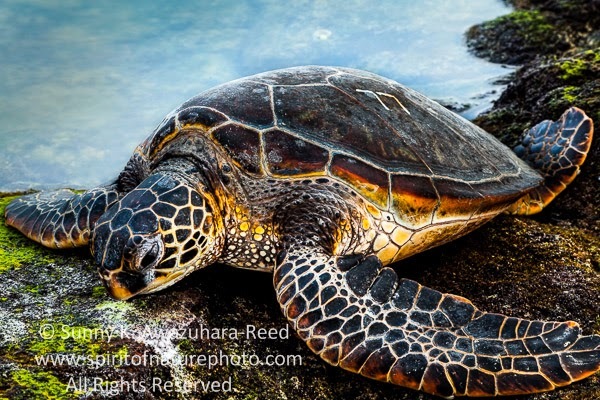 The great thing about photographing turtles is they don't move as much as most other wildlife. While I was adjusting the camera position, Mr. turtle slightly opened his eyes, slowly moved its head, and closed his eyes again; still laying in the same spot. 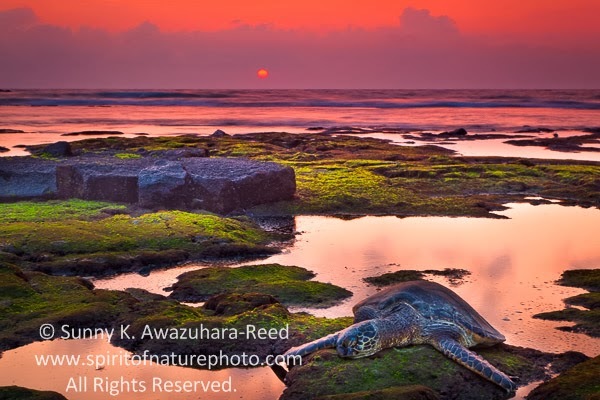 Warm orange sun hid behind the thin clouds above the horizon and beautiful rays reflected on the ocean and tide pools. When the sun almost touched the horizon, the whole scene turned to lavender! I kept shooting the nature's magical moment. The colors were changing each second as the sun was setting into the Pacific Ocean. Sunset is quick near the equator. It was spiritual moment on this tropical island.